Being Human : "Though the Heavens Fall" - As if I didn't hate Herrick enough. WAAAAAAA! I don't know if I want to watch the last episode now. Being Human : "The Wolf-Shaped Bullet" - Well. Wow. Not what I was expecting to happen, at least not exactly. That is a bit of a cliffhanger, even. Wow. Young Justice : "Bereft" - The team loses their memories. This was a fascinating look into the personalities of most of the team. I liked seeing how they interacted when they didn't know they were teammates. Poor Aqualad. Doctor Who : "Space and Time" - This was the red-nose special, two very short episodes featuring the Doctor, Rory, and Amy. And a very confused bit of twisty time and space stuff. Fun little "episode", looking forward to the new season. Green Lantern #61 - How on earth did he make Atrocitus a sympathetic character?!? Action Comics #896 - A crossover with a book I don't currently read ending on a cliffhanger. Sorry, didn't enjoy it. Justice Society of America #46 - Not sure what to make of this one. Waiting for a conclusion, I guess. All New Batman: The Brave and the Bold #2 - Ah, just what I wanted for Christmas, the Psycho-Pirate and Captain Marvel! Tiny Titans #35 - Alternate Aqualads are so cute! And I want some Aqua-squares along with Aqua-ohs! Brightest Day #17 - Hmph. No Aquaman. At least we're getting more of the Hawks story, finally. JSA All-Stars #14 - I actually care about most of the characters on this team more than the ones on the regular team. How about that? I enjoyed this issue. Batman Beyond #1 - Aquagirl! She doesn't get much page time, but at least she's there. Story isn't too bad. Torchwood #6 - As jumbled and confused as ever. But every story actually wrapped up, so I guess I'll forgive them for the moment. Ozma of Oz #3 - I'd almost forgotten how utterly creepy Princess Langwidere is. And Billina is still my chicken hero. But it's the Wheeler leader who makes this issue awesome for me, for reasons I can't disclose (Linda Medley, write your Oz book, please!). Green Lantern: Emerald Warriors #6 - Isn't Guy making his nightmares come true with his actions? Birds of Prey #8 - I'm Spartacus! What exactly has Dawn got herself into? Knight & Squire #4 - There is nothing quite as creepy to me as a doppelganger, and while this didn't fit that exact mould, it was still very creepy. All New Batman: The Brave and the Bold #3 - Nice Oz references. I'm not sure about the rest, though. Brightest Day #18 - Mera and Lorena, that's it? As for the rest, well... that Hawk-thing can't be over. Green Lantern Corps #56 - Wait, who am I rooting for in this one? Justice Leagues of America #53 - Done now? I hope? On to something a little more... interesting? Power Girl #20 - Wait, another crossover? I'm getting really really tired of Max Lord. Young Justice #0 - Not enough Aqualad. And wait, Tommy and Tuppence? Seriously? Where are they from, besides being two of Agatha Christie's earliest detectives? Tiny Titans #36 - Ah yeah, serpents of doom! I think I'll go dig up a few in my yard. DMZ #61 - And so we now have the origin of the Free States. Soon enough, we'll have the whole tale. Northlanders #36 - Sad ending to a sad tale. But then, most of these aren't laugh-a-minute, set in such brutal times and places. Doctor Who Vol 2 #1 - Spam invades the TARDIS. Nicely done, funny as all get out, and actually fit the characters for the most part. Doorways #3 - Took him long enough to figure it out. Soldier Zero #4 - Hmm. Nicely complicated story for the protagonist. I don't know how this is going to go, but it's looking nasty so far. Action Comics #897 - I don't think Luthor played that one well at all. And is he really missing what's going on around him, or is he just playing cool because he knows what's happening? Justice Society of America #47 - I'm still not sure if I like this storyline or not. I kind of just want it to end, so I'm thinking not. Zatanna #9 - Ok, good story. And the back-up story was strong as well. Liking this book. Fables #101 - This was reported as a) a good jumping on point, b) art by Eric Shanower, and c) heavily involving Oz, so we got it. And, yup, it's interesting. We'll eventually get the trades of the earlier issues, I think, but for now... fun stuff! 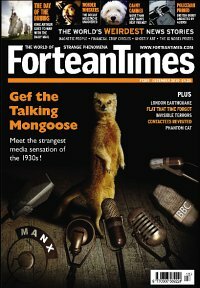 Fortean Times #269 (January 2011). The cover features Gef the Talking Mongoose of the Isle of Man. The story is really very funny, and also slightly perplexing. While I lean toward the giant hoax theory, I do have to wonder about some of the reported facts. I guess it's long past solving, now. But a fun one. And while the cover is bizarre, at least it's not embarrassing like a few in the past. Strangedays starts with Druids being recognized as an official religion in the UK, and continues with some great headlines, personal fave was "Death called symptom of bigger problem". Yeah, I'll say. The big picture spread was goats up in difficult to reach spots. More short articles include magnetic people, the flat that time forgot, predicted disasters, a pig and a lamb both with no back feet, and the Ig Nobel awards. There is a science article about wolves and dogs and how they may have affected human development. Ghostwatch is all about bugs and their relationship with ghosts, both as misidentifications on CCTV cameras and how they sometimes appear in classic hauntings. Archaeology talks about the tomb of Saint Paul and an early icon depicting him. There's also news about the oldest known shoe. Alien Zoo goes into the world of insects with a mega-millipede and a continuation of the saga of the blue spiders of Yorkshire. The UFO Casebook wraps up the five part Life With The Aliens series with an interesting summary of the articles so far, coming to no strong conclusions but pointing out that "Much of what we see within the alien contact story says more about ourselves that another species 'out there'." Another long article examines a particular UFO contact story and contrasts it with other contactee events. The Random Dictionary gives the stories of many well-known contactees, and pokes fun at their stories and how the types of stories change as time rolls on. Blasts from the Past covers stories of invisible things that damage crops and hurt people, including the Japanese Kamaitachi, also known as 'the sickle weasel', that slashes people then makes their wounds painless for a time. Another short article talks about a couple of mediums who use "ghosts" to create art. The Forum has one thoughtful article about cryptids, one intriguing article about financial market data, and one completely bizarre article about moustaches. The Reviews were great as always, but nothing stood out as a must read. The letters were pretty normal for this magazine, and the cartoon was nothing super special. All-in-all, yet another good issue of the best magazine available.